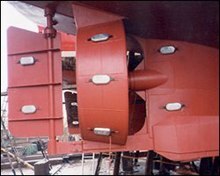 Aberdeen Foundries 'DEFENDER' brand Zinc marine anodes are designed specifically for use o n all types of marine craft for external hull protection. They are manufactured for use on fishing boats, cargo ships, trawlers and leisure craft. All of the anodes are suitable for subsea frames, drilling rigs and ROV applications where zinc is specified or required. 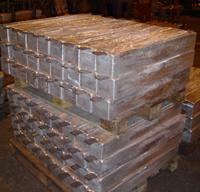 Zinc anodes are of US Military specification Zinc alloy Composition which is respected and used worldwide. We can custom design any zinc, aluminium or magnesium based anode to your size and insert attachment requirements at our site using our design and corrosion specialists. The following table shows examples of our standard range of anode which cover the majority of popular sizes for marine applications. Most Data sheet sizes are kept in stock. Aberdeen Foundries magnesium based anodes are designed specifically for use on specialist applications where Zinc or aluminium anodes are not suitable. In freshwater or estuaries the water resistivity may be considerably higher and a greater driving potential is required to give protection to submerged structures. You would also use magnesium in instances whereby you have to protect aluminium structures underwater such as ROVs. All of the anodes are suitable for subsea frames, drilling rigs and ROV/submersible applications where magnesium is specified or required. We can custom design any magnesium based anode to your size and insert attachment requirements. Most Data Sheet sizes are kept in stock including rods and magnesium ribbon which can be used as an anode or for de-scaling tanks. Flush fitting Hull Anodes for fishing boats, marine craft FSPOs, all shipping and subsea frames, where a flush fit anode is required. 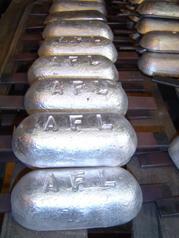 Aberdeen Foundries 'DEFENDER' brand Aluminium marine anodes come in the widest range of sizes and are for use in all types of applications for protection of harbours and jetties, platforms, ship hulls, tanks, drill rigs and pipelines. Aluminium is a cost effecient solution for Hull protection as the specific properties of aluminium-zinc-indium based anodes make them the best value for money in terms of the protection offered per kg of anode weight. Medium to large flush fitting anodes - Drill rigs, frame anodes, harbour walls and jetties. All applications where flush fit is imperative. More sizes are available! Aluminium anodes are AF Defender G3 specification which is an Aluminium-Zinc-Indium based alloy of the type most commonly used around the world today. AF Defender G3 has a Type Approval Certificate from DNV for long term performance*.